We tend to treat carrots as supporting players — they may serve as flavor enhancers for soups or stews, or as a sidekick to meat. When served raw, they often function mainly to convey dip from bowl to mouth. But with their terrific flavor and color, carrots are well worth serving on their own. And this traditional Moroccan dish brings out their potential. Brief cooking mellows their woody texture, while gentle spices mix with lemon and olive oil to envelop them in smooth, subtle flavor. Like many Moroccan “salads,” this one can be eaten at the beginning of the meal, or as a side dish (where it pairs exceptionally well with grilled and roasted poultry, fish, or meat). Either way, it will steal the show at your table. In last week’s post on Moroccan Orange and Radish Salad, we noted that the American-style salad course isn’t traditional in Morocco. Instead, the host places several light salad-like dishes on the table at the beginning of dinner — some of which remain there throughout the meal. This traditional carrot salad is one of the dishes typically served at the beginning, and it often stays on the table until the main course is finished. But at a Western table, it works equally well when served by itself as a starter, or with the rest of the meal as a side. 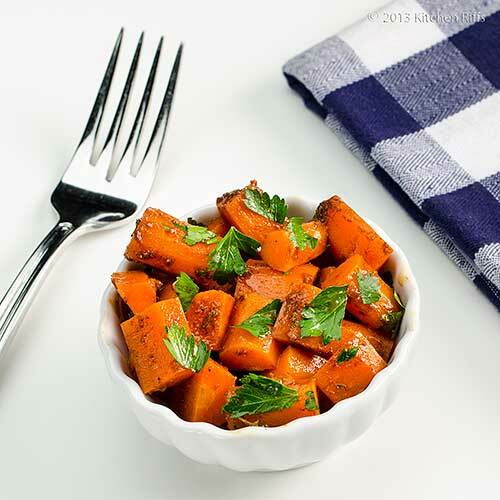 This recipe features cooked carrots (there are also raw versions). For this dish, you steam or boil the carrots until they are just tender, then marinate them in spices and lemon juice. Right before serving, you mix them with olive oil (which combines with the lemon juice to form a sort of vinaigrette). When I lived in Morocco, I had countless variations on this and similar dishes. My recipe is adapted from Paula Wolfert’s 1973 Couscous and Other Good Foods From Morocco. A couple of years ago, Wolfert updated and expanded the book, retitling it The Food of Morocco. This recipe takes about 20 minutes to prepare, and it benefits from some resting time (at least an hour — see Step 4). It will serve 4. Scrub and peel the carrots, then cut them into dice of about ½ inch, or sticks measuring about 3 inches by ½ inch. Steam (or boil) carrots until just tender — usually 6 to 8 minutes. 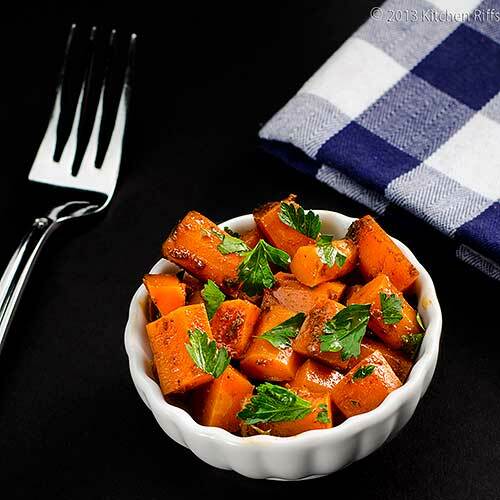 Remove carrots from heat (drain if you boiled them) and place in a serving bowl. Add minced garlic, paprika, cumin, cayenne pepper, cinnamon, sugar, and lemon juice. Mix, taste, and add salt to taste. Chill the carrot mixture for at least an hour. Right before serving, drizzle on olive oil and mix briefly. Garnish with chopped parsley. Exact ingredient quantities aren’t critical for this recipe. I sometimes add more garlic and/or lemon juice, for example. And I sometimes add black pepper to this dish — it provides a nice note. The quantity of cayenne pepper in this recipe is typical — perhaps even slightly on the high side. But if you like spicy, you might want to increase the amount. If you prefer a garnish that’s zippier than parsley, you can substitute chopped cilantro. You can also substitute wine vinegar for the lemon juice. Basically, this recipe is a template, and you can change up things to suit your cravings of the day. “I’m glad to see we’re having another Moroccan dish,” said Mrs. Kitchen Riffs, with perhaps the tiniest note of triumph in her voice. “What do you mean?” I puzzled. I always hated that riddle. Here's something really useful to me: I love carrot, but I tend to use them either raw or in a stew. I would eat these as a snack, too! Hi Alex, I'm too often the same way when it comes to carrots - they're just another ingredient in a dish, or I serve them raw. But they have so much more flavor, particularly the spring carrots we're getting now! Thanks for the comment. Great flavors in this salad and so simple to prepare. Beautiful color as well. Nice recipe! Hi Anonymous, glad you like it! Thanks for the comment. Hi Vicki, this recipe is a real winner - easy, tasty, healthy, and pretty. Thanks for the comment. Hi Ilke, isn't that a nice combo of spices? And I do have nice Morocco memories. ;-) Thanks for the comment. I made a similar salad years ago but I partially roasted the carrots first. I'm dying to try this. Hi Uru, they're wonderful! And I'll bet you'd love these (before dessert, of course). Thanks for the comment. Hi Maureen, I'm looking forward to the egg coming first, too! ;-) I really like the idea of partially roasting the carrots - something I'll try. Thanks for the comment. Hi Zoe, it's a great dish! And loads of flavor. Thanks for the comment. Hi Charlie, this really is a fun recipe, and exceptionally tasty. I go back and forth between serving this as a starter and a side - it works well in both cases. Sounds as if you're having a wonderful holiday! Thanks for the comment. I love seeing a side featured - and really a carrot entree! Why not? The spices really enhance this - makes me fall in love with carrots again. Oh my - still discussing chicken or the egg? Makes me want to make up a story and end the debate! Great way to use carrots! I never know what to do with carrots, I usually just eat them raw, roast them or make a soup with them. Never thought of a carrot salad though, it sounds delicious especially with the great spices you used! Oh my gosh these are divine. I need to try these asap. I have such a weakness for carrots. I like the spices that you used to flavor the carrots. This sounds like a wonderful salad. Hi Claudia, the chicken & egg question will never end! ;-) We should all be in love with carrots - they have so many virtues, but they're always playing second fiddle. This dish helps change that! Thanks for the comment. Hi Natalie, with this dish it's like you're tasting carrots for the first time. ;-) Thanks for the comment. Hi Kim, this is a truly fun dish. Since you're the newly crowned Meyer Lemon Queen, you definitely want to use Meyer lemon in this - it'll sweeten it slightly, but it'll be super. Thanks for the comment. Hi Dawn, it's a really fun salad! And the spices are wonderful. Thanks for the comment. Beautiful!! I love eating carrots raw or slightly cooked or in desserts, but I really don't like them in stews or overcooked mushy ones. I feel that all the wonderful flavour of carrots is lost. Now this carrot salad however, looks amazing! The colours are beautiful, the carrots are perfectly cooked and the flavourings sound wonderful...I love the sound of cinnamon , sugar and lemon! Yum! Thanks John, now I have a new carrot dish to try on my hubby. Am smiling: have cooked Moroccan forever [this dish often with raw carrots, but want to try it this way!] yet have not had a chance to visit it myself. Yet I must have a Moroccan mindset to some degree as I often put the vegetable dishes on the table as a starter and leave them there for everyone's choice with the following dishes served! Beautiful flavours here :) ! Cumin is my all time favourite spice. Add that to lemon juice and you have my attention. Carrots are a great food but can be a little boring so this is a nice way to dress them up. Hi Barbara, this is good when cold! Don't you love the spices in this? Truly good stuff. Thanks for the comment. Hi Nazneen, whenever I use carrots to flavor a stew and they get overcooked, I always fish them out! And usually steam some carrots to add to the stew so they have better flavor. Anyway, the carrots in this dish are wonderful - and the spices are so enticing. Enjoy! Thanks for the comment. Hi Eha, I don't know whether I like Moroccan carrot dishes better with cooked or uncooked carrots. I think maybe cooked, simply because (at least it seems to me) I can be a bit more subtle in the spices. Thanks for the comment. Hi Suzanne, isn't cumin nice? It also has a real affinity for cinnamon. And I agree carrots can be boring, although this dish most certainly is not! Thanks for the comment. John, I love the spice combination on these carrots! I don't believe I've had that 4 spice combo of cumin, cinnamon, paprika and cayenne. Being a huge carrot lover, these are a must make. So glad you gave us another Moroccan dish. This one is definitely a keeper! Thanks! Hi MJ, you might want to play with cinnamon a bit in your cooking with chilies - it works really, really well (and not particularly sweet, as you might think). Hope you enjoy this! Thanks for the comment. 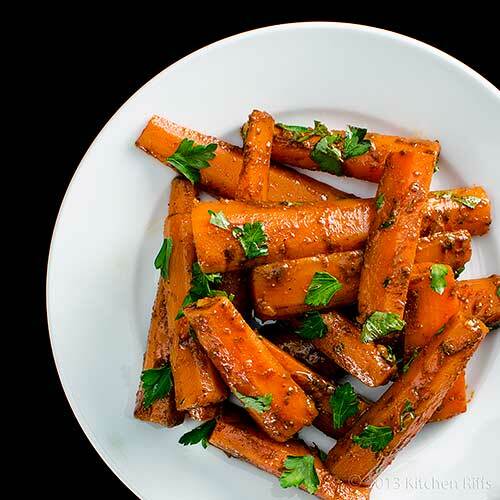 I often make a similar glazed carrot dish that has the warm spices of cumin and paprika in it. I also add a dribble of honey just to bring out a little more sweetness. This salad is so visually appealing, John. So often a carrot salad is a shredded carrot salad and though still enjoyable, one where the carrots still look like carrots is such a welcome change. Add that spice mix and this is something I really cannot wait to try. Thanks, John. This was a great post & recipe. Can't wait to see your chicken, lettuce, and homemade mayo salad. That sounds delicious! Love the flavor combo on this salad. We do not have a stand alone salad dish in Bangladesh either. A dish I love. Moroccan food is so delicious. Your carrot salad looks really tempting! Hi Carolyn, this dish is probably a 2nd cousin to glazed carrots. Paprika and cumin combine so well with carrots, don't they? Thanks for the comment. Hi John, this salad is worth making, and people will eat more of it than you think they will (always a good thing!). Thanks for the comment. Hi Lail, interesting to hear that Bangladesh doesn't have a separate salad dish, either. And this flavor combo really is nice - so enjoyable! Thanks for the comment. Hi Rosa, it is tempting, it is! And I agree with you that Moroccan food is wonderful - a thoroughly enjoyable cuisine. Thanks for the comment. What a wonderful way to serve carrots! This dish looks beautiful! Hi Ray, isn't Moroccan food wonderful? Thanks for your kind words, and comment. Hi Alyssa, I know some raw carrot recipes that are essentially the same as this, but I think the cooked one has better flavor (and makes it a better side dish, too). This one is definitely worth a try! Thanks for the comment. I loved the glazed look of the salad. Steaming the carrots gives the vibrant orange color which is a plus point of this salad I think. The spice blend used in this salad is brilliant. I absolutely loved it. I am adding it to my to do list. Hi Ashley, although this dish tastes wonderful, the look of it is what most attracts me - IMO it's really pretty. Thanks for the comment. Hi Shibi, Moroccans steam a lot of things (including cous cous, perhaps their most famous dish). And although I've prepared this dish by simmering the carrots, it's just as easy to steam them, and the results are better. And isn't this a nice spice blend? I think you'll enjoy this. Thanks for the comment. Lovely, John! Carrot salads are always a hit in our house and the spice mix here is terrific (and I'll be doubling the cayenne as you suggest). I love homemade mayo and can't wait to see your chicken salad! Hi Hannah, isn't this a nice salad? I hope you enjoy! ;-) Thanks for the comment. Hi Nusrat Azim, isn't it nice? Delish, too! Thanks for the comment. Yet another beautiful recipe with delicious spices! Thanks for sharing, John! Such a nice way to make ordinary carrots into a special side! Hi Kiran, aren't these spices nice? This is such a tasty dish! Thanks for the comment. Hi Liz, this is indeed a special side! Such lovely flavor. ;-) Thanks for the comment. I love the colors and the elegant simplicity of this dish! It looks so appetizing and spring-like. Hi Daniela, isn't it pretty? I do enjoy colorful dishes! Thanks for the comment. I always buy a bag of carrot, it's a mainstay in my cart whenever I go grocery shopping. But you are right it's always used in stews or soups. Such a wonderful salad that brings to the fore - the humble carrots. It looks delightful and bright. Love it! I agree with you, carrot is good enough to be the star of the dish! Funny thing is, I make almost the same carrot salad frequently, it's so delicious. Beautiful, popping photos, John! Hi Amy, roast carrots are great! And I'm with you on enjoying the natural sweetness that carrots possess in abundance. Thanks for the comment. Hi Malou, carrots are great in soups and stews, but it's fun to give them a starring role from time to time. They really have wonderful flavor! Thanks for the comment. Hi Gourmantine, although this carrot salad is quite common in Morocco, it's hard for me to believe that others don't have a similar salad. The cinnamon, maybe, might be unique to Morocco. Thanks for the comment. This is beautiful, John! When I saw Moroccan, I wonder if I have any ingredients at home, but surprisingly you listed everything that I have. That means I can make Moroccan food at home! As I haven't been adventurous enough, I didn't even think that's possible. This will be our side dish for dinner very soon! Hi Nami, fortunately no exotic ingredients needed for this dish! Although it certainly tastes exotic. ;-) Enjoy! Thanks for the comment. Love carrots. This would be great on a mezze spread! You are turning out some good ones! Hi Abbe, this would be perfect for a mezze spread! Thanks for the kind words, and comment. Hi Juliana, it's a great dish - I think you'd enjoy it. I'm having a great week (hope you are, too! ), and thanks for the comment. Wow, it looks so delicious. I'm definitely going to give this a go when I'm hosting a dinner party next time. I've only used a carrot as a sidekick to my meat stir-fry or as a raw ingredient in a salad. A bit boring, ha? :) I love Moroccan dish in general, so I think I will like this one too. Thanks so much for sharing the recipe. Hi Sue, it's easy to take carrots for granted! But they're a wonderful veggie, and this recipe brings out their best. Thanks for the comment. Oh my, that looks just amazing !! Hi Raymund, this is really a great dish, no doubt about that! Thanks for the comment. Hi Marta, carrots really are pretty healthy, aren't they? And Moroccan recipes bring so much flavor! Thanks for the comment. Hi Bam, I live in Morocco in the early- to mid-70s. I'm ancient! I do the pouch trick with carrots and other veggies sometimes, too. Thanks for the comment. Hi Sketched Chef, it is an amazing dish! Thanks for the comment. Hi John, that's a wonderful carrot dish. Look so inviting and refreshing. Nice colour too. Hi Amelia, don't you just love the colors of carrots? Such a pretty veggie. Thanks for the comment. 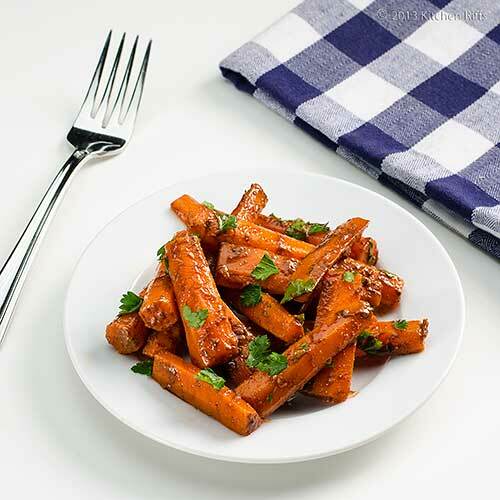 We love carrots in many ways and your Moroccan Carrot Salad sounds absolutely divine. What a delicioius spice combo! Hi Judit & Corina, this really is a nice salad! Thinking about having it again this weekend. ;-) Thanks for the comment. Hi Terra, it's easy for carrots to be boring, alas, unless we treat them differently. This is different! Thanks for the comment. I like this new take on salad! Nice thing layer of sweet tart dressing is so clever. I imagine I can use it on sweet potatoes or regular boiled potatoes. Love it. Hi Jayne, the dressing would be a natural with sweet potatoes! And although I've never tried it, I think maybe corn, too. Thanks for the comment. What a beautiful looking salad - I absolutely love carrots. One of my fave ways is just to roast them in olive oil until they caramelise, this looks like another must try recipe! Hi Christine, roast carrots are wonderful! Maybe my favorite way to prepare them. Thanks for your comment.